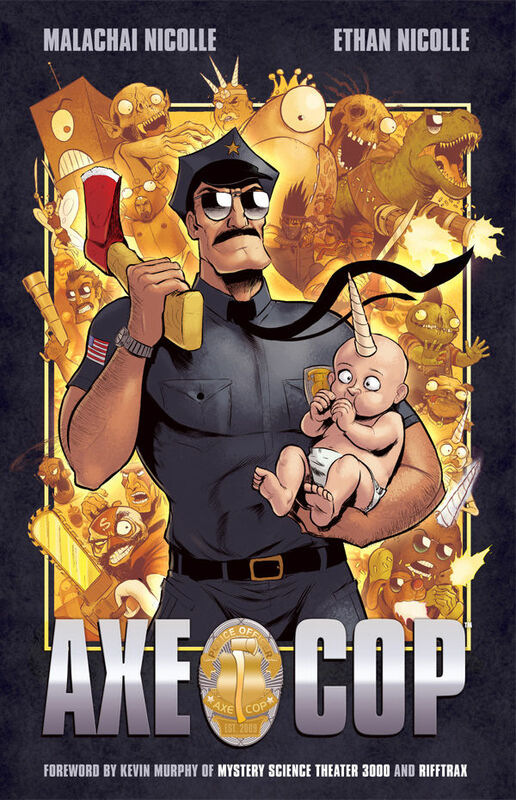 Axe Cop: the name says it all. One day a cop found a magical axe and used it to fight crime. Around the same time, five-year-old Malachai Nicolle teamed up with his professional artist brother Ethan to write a comic book. Ethan took Malachai's words—which usually involve explosions, aliens, and secret attacks—and gave them a visual flourish. And thus Axe Cop was born. Contained in these pages is a frenzy of unchecked childhood imagination that has been given infinite space to roam free. Malachai invents adventures involving machine gun-toting dinosaurs on the Moon and magic babies with unicorn horns. Axe Cop's adventures are narrated in a plain-spoken manner which adds to their appeal. Axe Cop always says exactly what he is thinking. "We should put these heads on a stick and hide bombs in them." This sense of hyper-earnestness and lack of sarcasm on display makes book's tone ridiculously refreshing. Ethan's commentary helps ground the mayhem and offers insight into the creative process. Often he will ask Malachai questions about the story. Ethan explained how the comic went from a small pet project to an Internet sensation. People started writing in, asking Axe Cop different questions which Malachai would answer. When asked if Axe Cop has ever been in love, this was the reply. "I will never be in love because I work all day and all night as an Axe Cop. Night is the easiest time to kill bad guys because they are asleep, so I have no time for love. Typically I sneak into their rooms at night...wearing a black cat suit"
This question-and-answer method gave our protagonist more depth and backstory, albeit a kind of deranged one, than what one would initially think possible for an axe-wielding officer of the law who talks like a child. In a poignant example, Axe Cop accidentally kills someone that he mistook for a bad guy. When he realizes his error, Axe Cop breaks down into a mess of manly tears. There is some danger in the simplicity of the formula, and I don't mean the risk of decapitation. If you rush through Axe Cop too quickly, you may experience a kind of mental sugar rush and inevitable crash. Even though Axe Cop is too awesomely intense to take in one sitting...it is still thunderously awesome. It is no wonder that such an inventive project is being adapted into a cartoon for FOX network this month. Still, as a librarian I must always insist: Start with the book first and get chopping!